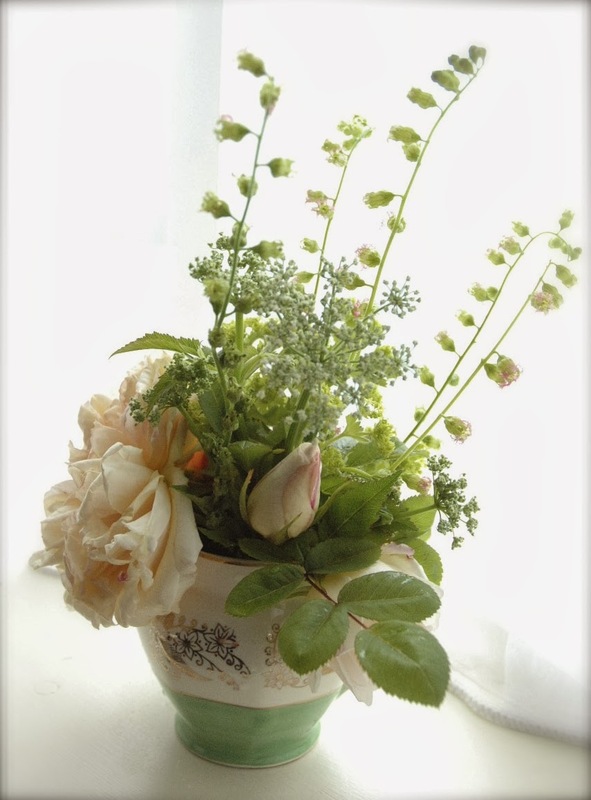 Tuckshop Gardener: Is there life after ammi? The midsummer hiatus is happening again - my early summer lovelies are going over and the later perennials have not yet got into their stride. 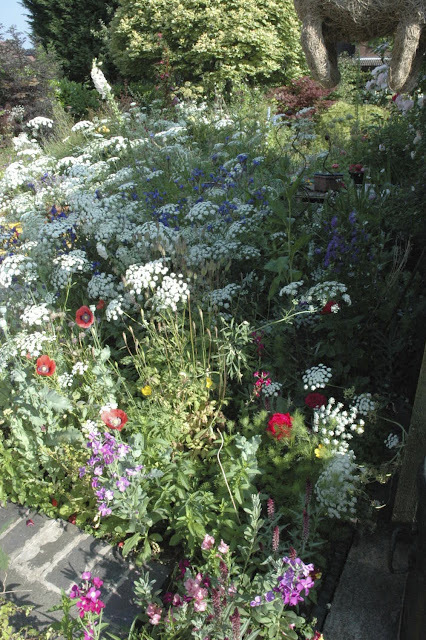 The ammi has finally flopped, smothering its neighbours in the border and I am beady-eyeing its drying flower heads, waiting for the moment when I can collect oodles of seed to sow in September for next year's crop. It is definitely a flower I want lots of 2014 as it such a brilliant filler and looks fantastic with virtually anything. 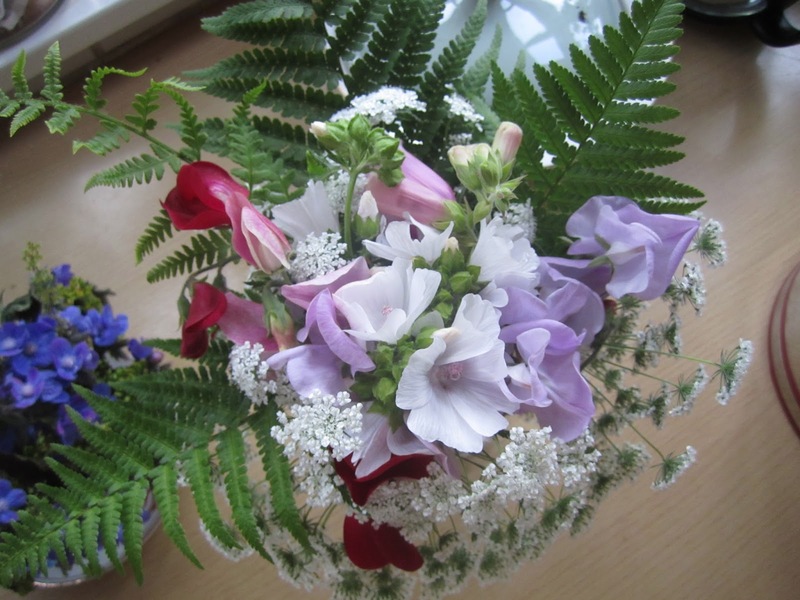 It's only slight drawback is that when the flowers are very mature, they make the surface of any arrangement look like you've been holding this year's AGM for the Homepride flour graders convention. The kitchen worktop is starting to host a collection of plastic pots containing cerinthe seeds at various stages of desiccation - so expensive to buy, but every plant that grows will provide you with ample quantities of black nuggety seed for to keep replenishing for several seasons. I'm going to have another go at September sowings for that as well - last year came to nothing, but I don't think I'm going to take 2012 weather as any kind of benchmark for normality. It has been brilliant to have heat and dryness this year - makes me feel like I've emigrated! The dahlias are flourishing in the current conditions, and sedums are fleshing up well to provide a glaucous counterpoint for bright flashy red 'Witteman's Best' in summer bunches. I can tell that summer is in full swing, as the lavender hedge at the front of the house in sprouting into gloriousness, and my candelabra-style light fitting downstairs is sporting several bunches hanging upside down to dry, ready for arranging in lean times later in the year. The statice that I sowed in late spring is just starting to come into flower, so I must remember to cut and dry some of that for autumnal arrangements too. My roses are totally crispy and require constant deadheading, so I have to bid them farewell and await their second coming in autumn. It really makes me feel like the year is whizzing by to know that their first show is already over. Excuse the dangly wicker pig's legs in the top part of this shot. I know them well, but they even had me bewildered when I first studied this photo! What is going to replace the ammi in the next wave of flowers? It has played such a big role in the borders, that I'm going to feel a bit bereft without it. You'll just have to watch this space to see what comes in to fill its boots - and so will I, as I'm really not sure what can follow in its wake at the moment. The Ammi majus is a terrific annual. The last few years I have sown the Orlaya grandiflora which has the same effect. Your posies look like little bridal bouquets. Just lovely! Must try to get some Orlaya to try for next year. Thanks for the floral vote of confidence.